Summer season is driving season, and if you don’t believe me, just take a look at the nightmarish traffic jams getting in and out of any urban centre in Canada on a weekend. People are scrambling across our highways to go camping, canoeing, fishing, boating, hiking or just hang at the cottage. Good for them, they’ll be off the road soon enough. But the rest, they’re just driving. Across town. Across the province. Maybe even across the country. I like to do that every few years myself, and last summer was one of those times. Vancouver to Montreal and back with lots of crisscrossing to other places in between. This is a big ol’ country with lots to see from a car window, but one constant is the parade of classic roadside motels strung along the Trans Canada Highway. I could go on at length about any aspect of this anachronistic collection of neo-Hoser architecture but there’d be no point and it would only give it more attention than it deserves. Instead, I’d like to comment on the naming of these institutions, which I sporadically kept track of for the six weeks I was on the road. If you see this in a motel parking lot, well… you’d be a fool to stay there. To start, there were many clusters of names (Silver Sage, Ranchman, Prairie Oasis, Cowboy Hat) or vague compass points (Superior North, Nor-West, Best Northern) that, should you find yourself without a map, might have helped you locate yourself. Forests and trees figured prominently in the canon (Woodland, Westwood, Black Spruce, Pine, Lone Pine, Shady Pines, Pine Grove,) and segued nicely into what I’d call the “overlook” trope (Pine View, Park View, Valley View—several of these—Mountain View,) through a river jag (River View, River Mist, Riverside, Deep River, High Falls) to land up on a colour theme (White River, White Otter, White Fang) that may or may not have something to do with snow. I guess this person is getting ready for a Basil plant fiesta! A few generic classics (Continental, Ambassador, Traveler, Holiday, Hide Away) and cross-border throws (American, Trans Canada), pathetic attempts at a cute portmanteau (Sun-dek) and some that made absolutely no sense whatsoever (Pals, Red Top, Tel Star). Oddly, there weren’t too many that directly channeled the history I was traversing (only Circle Route, Voyageur, Trading Post, Mohawk, and a couple Champlains) and I found that worrisome, or at least sad. Sad enough to want to pull in to any of an uplifting series of names that, on the face of it, had no place in the mountains, prairies and boreal forests of our beloved land, but which added an exotic flavour to your day every time you counted one and always made you go “Hmmmm…” (Villa Bianca, Villa Inn, Catalina, Bel-Aire, Sapphire, Flamingo Spanish Fiesta). In fact, I might hit the road sooner than I think… because, of course, it’s the quickest way to Paradise… or at least its eponymous motel. 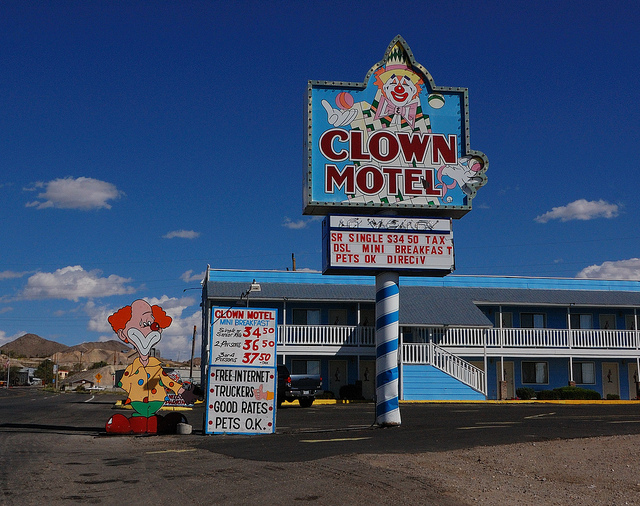 There’s no circus for 4,000 km, but this place is haunted and that’s NOT funny.